It was about this boy who meets this guy. Something happens where the guy is killed by bad guys as the kid escapes to a pocket dimension. It turns out that the guy and all the inhabitants are versions of himself, old, young, male, female, even a few animals(?). He is an outcast here and few people want to be kind to him because the guy who died was a popular mentor. They fight evil. The cover had a red-headed kid on it, with people in the background flying through the sky(?). Anyway, the cover stood out in my memory because it was really stylized and bright, almost like a comic book. angie is a new contributor to this site. Take care in asking for clarification, commenting, and answering. Check out our Code of Conduct. 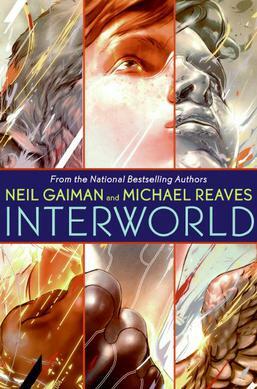 InterWorld (2007) by Neil Gaiman and Michael Reaves? InterWorld tells the story of Joey Harker, a very average kid who discovers that his world is only one of a trillion alternate earths. Some of these earths are ruled by magic. Some are ruled by science. All are at war. Joey teams up with alternate versions of himself from an array of these worlds. Together, the army of Joeys must battle evil magicians Lord Dogknife and Lady Indigo to keep the balance of power between all the earths stable. Many of the other Joeys initially resented Joey for causing Jay's death, but soon come around about him as his skills improve. Found with the Google query book "* dimension" "versions * himself" site:goodreads.com. angie is a new contributor. Be nice, and check out our Code of Conduct.